It's a case of Christmas arriving even earlier than usual in Milton Keynes this week as the new city's theatre hosts a musical spin-off version of the 2009 festive hit film, Nativity! So popular was the film with family audiences that its creator and writer Debbie Isett's franchise has spawned three additional offerings, the latest being Nativity Rocks! which opens in cinemas across the country a week on Friday. Fortunately the original Nativity storyline remains the basis of this enjoyable festive stage musical extravaganza and again it focuses on two different Coventry-based schools putting on their rival Christmas offerings. One school is desperately under-performing and in Ofsted's special measures while the opposing private prep school has a surfeit of high achievers. I loved the original film and especially the performances of Martin Freeman as failed actor and St Bernadette's hapless schoolteacher Paul Maddens, Jason Watkins as Gordon Shakespeare from the rival Oakmoor establishment and, of course the brilliant Marc Wootton as St B's crazy but loveable teaching assistant Desmond Poppy. Luckily the same characters all feature in the stage version with the charming Mr Maddens (Scott Garnham) being charged with producing his Catholic Primary School's musical Christmas nativity by stern headmistress Mrs Bevans (Jemma Churchill) for a second successive year. Having been responsible for the previous offering which got a dismal minus-two stars from creepy theatre critic Patrick Burns (Jamie Chapman), Maddens is offered the help of Mrs Bevans' disruptive but hilarious nephew Mr Poppy (Simon Lipkin) to help out. With Mr Shakespeare (played by Andy Brady) pooh-poohing anything that St Bernadette's hopeless kids could possibly produce, Mr Maddens was desperate to gain the upper hand against his five-star reviewed rival. So he boasts that his former girlfriend Jennifer Lore (Ashleigh Gray) is now a big-shot Hollywood executive producer and that she is flying in from her home in Los Angeles especially to film his musical-style Nativity play. However as Mr Maddens hadn't actually spoken to her for years, his lie soon becomes a nightmare after the eccentric and child-like Mr Poppy tells the children that they're all talented stars and that they'll all be in the film, thus fuelling what starts as a silly boast to whole new level. With every St Bernadette’s pupil and their parents now expecting a part in what Mr Poppy tells them will be a real musical extravaganza, it's all 'Sparkle and Shine' as the city's Mayor offers the schools the ruins of Coventry Cathedral in which to perform their nativity...surely it must be the perfect start to Christmas? 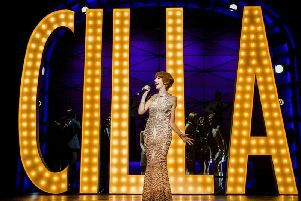 All the favourite sing-a-long songs from the film are included – Nazareth, One Night One Moment and, of course, Sparkle and Shine – while Debbie Isitt has again linked with co-composer Nicky Ager to expand the original six musical numbers to around 20 for this stage production. And once again they've come up with a string of toe-tapping, catchy songs which are sung with gusto by the entire cast and particularly the talented youngsters. Mr Shakespeare's Oakmoor pupils – who are involved in their school's colourful 'King Herod's Rock Opera' – are made up of youngsters between the ages of nine and 12 years from the Milton Keynes area, namely: Marie Peedle (aged 11), Kuhu Agarwal (9), Darcie Griffiths (10), Caitlin Le Roux (10), Daisy Reynolds (9), Darcy Springall (9), Keanne Skye O’Quinn (10), Adelaide Barham (11), Alesandro-Aurelia Borrelli (10), Regan Parker (9), Layla Waggott (9), Elissa Birkett (11), Tora Doyle (9) and from Sandy, Kaspar Cahill Ritter (11). Meanwhile Mr Maddens' St Barnadette's children are: Evie Bennell-Low, Demi Delord, Joseph Duffy, Kheiri Issac-Osmani, Betsy Jiggins, Marlie Love, Jasmine McKenna, Joshua Millard-Lloyd, Amy-Louise Mulhall, Aston Sidwell and Nicholas Vakis and both sets of youngsters are superb. However just as in the film, it's Mr Poppy who steals the limelight as far as the comedy is concerned with Simon Lipkin – who also features in the new film – certainly making the part his own. He has a wonderful way with the children while delivering plenty of great lines and references to other shows, very much in the traditions of a pantomime. As for Scott Garnham (a dead ringer for Martin Freeman! ), he is excellent as Mr Maddens and he travels with two of his pupils to the USA to plead with his former fiancée to help bring his lie to life. I particularly loved Ashleigh Gray's voice and would have liked to have heard more although her duet with Paul Maddens in the moving Suddenly was a real winner. The clever use of on-stage Christmas present-style boxes were used to good effect while the choreography, courtesy of Andrew Wright, is not too ambitious and the children take it in their stride. Meanwhile it's George Dyer who is responsible for musical supervision and orchestration and, despite having just five musicians in the theatre's pit, they never miss a beat. I can't help but make mention of Cracker, the cuddliest, cutest, most placid dog imaginable which is handed around the stage by the actors after being given as a present to Jennifer by Mr Maddens just before they split up. The whole cast received a deserved standing ovation at Wednesday's opening night, the glitzy Nativity! 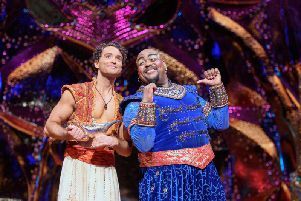 The Musical being the perfect feel-good show for all the family and it could easily replace a pantomime at this time of year.